Montana is home to an abundance of natural hot springs, which provide healing and relaxing mineral waters. Many of the springs in Montana are conveniently located to ski resorts and parks, making them a great place to relax after a full day of activity. Many others are part of their own resorts, so guests can step out of their luxurious rooms or rustic cabins and watch the stars from the comfort of a steaming pool. 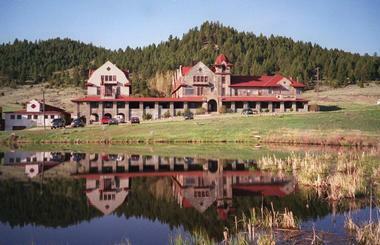 Boulder Hot Springs is part of the Inn and Spa of the same name, which has been open and operating since 1883 and is listed on the National Register of Historic Places. The sprawling, historic building is set on nearly 300 acres of land and is surrounded by a forest full of elk, deer, bear, fox, and more. Rooms at Boulder Hot Springs are elegant and comfortable, but what really draws guests is the natural, geothermal hot springs. 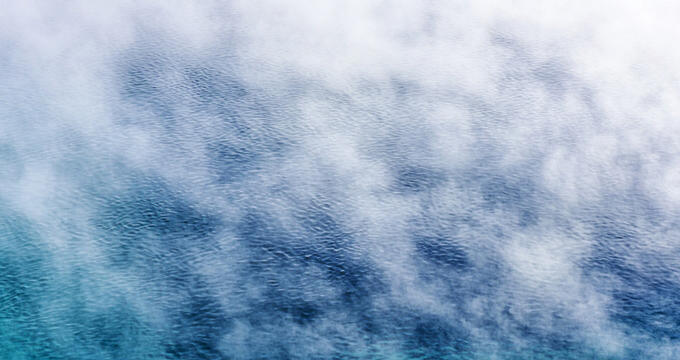 The springs heat the entire building, and are also present in an outdoor swimming pool, indoor plunge pools, showers, and even a mineral steam room. Conveniently located near Yellowstone National Park and Gallatin International Airport, Bozeman Hot Springs Spa has been providing a relaxing natural setting for guests for over a century. The hot springs spa features twelve individual and unique pools that range anywhere from a brisk 59 degrees to a balmy 106. They also offer a full gym and fitness facility for guests looking for a workout. 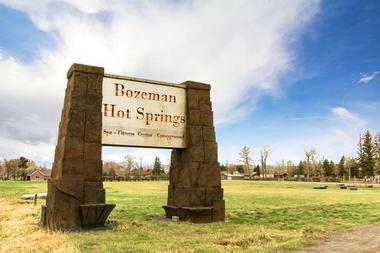 Bozeman Hot Springs Spa is open year round, and it is a great place to relax the muscles after a long hike in Yellowstone or after a long day spent skiing at nearby Big Sky Resort. 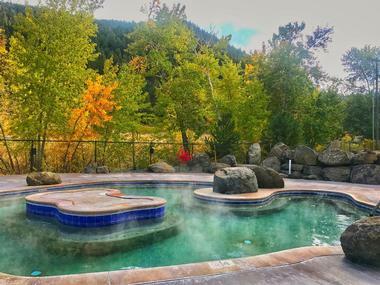 Broadwater Hot Springs is on the site of both a hot and cold springs, so each of their pools and spas are both heated and cooled with naturally flowing hot and cold springs to create the optimal temperature for guests to soak and relax. 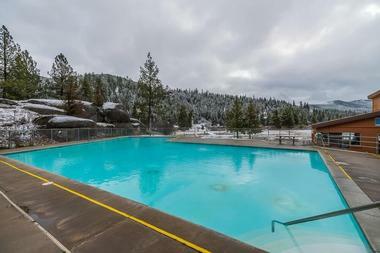 Visitors to Broadwater Hot Springs can choose to relax in the large Springs Pool, which stays between 97 and 102 degrees, the Hot Tub (101-104 degrees), the Cold Plunge (60-70 degrees), or the Soaking Pool (97 to 102 degrees) which is lined with benches and perfect for relaxing. Visitors who want to play and swim can use the Recreation Pool which, at 25 x 70 feet, is large enough for playing, kids, and swimming laps, and at 89 to 93 degrees, the water is warm and comfortable without being too hot. Just a short drive from Yellowstone National Park, Chico Hot Springs is a great destination for families, friends, solo travelers, and adventurers of all kinds. The hot springs are home to Chico hot Springs Resort and Day Spa, a historic hotel and restaurant with delicious food and comfortable accommodations that range from elegant guest rooms to rustic private cabins and cottages. 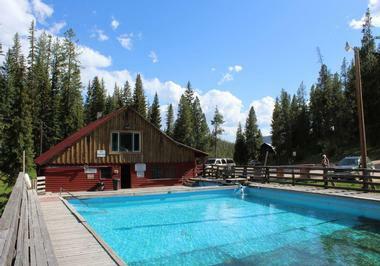 There are two natural mineral springs on the property, which are naturally heated and provide a great setting for watching the sunrise, gazing at stars in the big Montana sky, or chatting and relaxing with friends while letting every ache and worry soak away. This hot springs resort is open year round for guests, and in the winter visitors will have convenient access to Maverick Mountain, where they can ski, snowboard, snowmobile, and more. At Elkhorn Hot Springs, guests will stay in beautifully appointed lodge rooms, or comfortable, modern cabins on the premises. 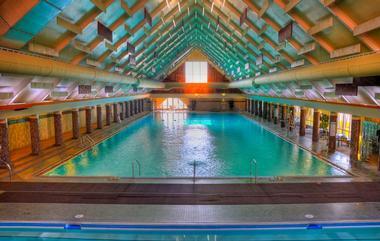 The resort is home to two large, natural hot spring mineral pools, and a sauna as well. Visitors staying at Elkhorn Hot Springs resort will find many attractions nearby, like Elkhorn Mine, hikes to an old ghost town, and cross-country skiing or hiking trails to the top of Comet Mountain. Relaxing in a hot springs pool is one thing, but at Fairmont Hot Springs, visitors can take it one step further and slide down an epic, 350 foot waterslide into the pool. There are two hot springs swimming pools at Fairmont Hot Springs, one of which is indoors and the other of which -- the one with the waterslide -- is located outside. There are also two mineral soaking pools at the resort, one inside and one outside, for guest use. The natural spring water is about 155 degrees, which is then cooled to various comfortable temperatures around the resort. During the summer, guests can enjoy the use of a poolside bar right next to the hot springs pools, where they can partake in a delicious cocktail as they relax in the warm, mineral waters. 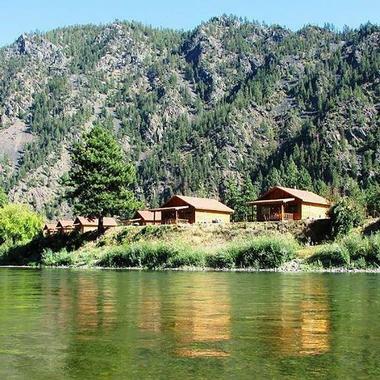 This guest ranch is located on the Sun River, where the North and South forks converge, and its scenic backroads location, miles from the nearest town and with a maximum of only 20 guests at one time, K bar L Ranch and Medicine Springs is the perfect spot for a relaxing vacation. Guests can spend their days horseback riding, hiking, fishing, or hunting, and then come back to the ranch at the end of the day for a delicious evening meal and a therapeutic soak in the natural geothermal springs that collect into a warm, 86 degree swimming pool. 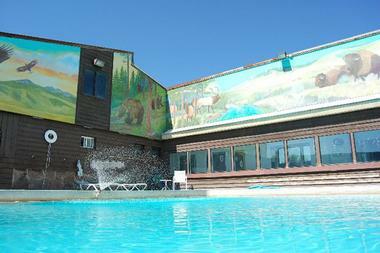 Lolo Hot Springs has both indoor and outdoor hot springs and swimming pools, some of which are open seasonally. The resort has a bar, restaurant, and casino on the premises, so guests will find themselves with no shortage of entertainment options. 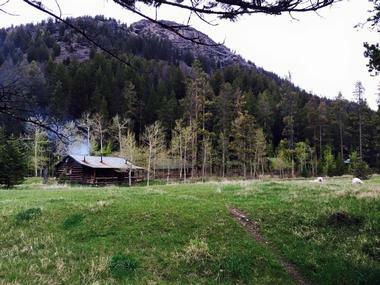 There is also lots of opportunity at Lolo Hot Springs for horseback riding, miniature golf, and cross country skiing. Visitors can stay in a tent, a cabin, or bring their RV for an epic hunting or fishing trip, or just for a relaxing vacation away from it all. 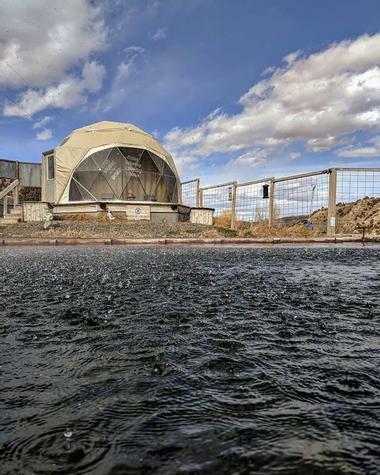 After a long day spent taking advantage of all the activities and excitement that Lolo Hot Springs has to offer, guests will love a relaxing soak in the hot, natural springs pools. Lost Trail Hot Springs, or Gallogly Hot Springs, has been used for centuries by people crossing the Continental Divide. The springs are located along an old Indian trail, and the first building at the springs was built in the 19th century by a woman who wanted her sick son to experience the medicinal healing powers of the hot springs. Today, this peaceful spring is located in the Bitterroot Valley in Montana’s western region. Visitors traveling between Yellowstone and Glacier National Parks will find it a convenient halfway point to camp out and enjoy the peaceful sounds and sights of nature, perfect for photographers, birdwatchers, and more. Spa Hot Springs Motel is just a short 35 mile drive from Showdown Ski Area, and is also close to Kings Hill, which has over 200 miles of amazing trails for snowmobiling, making this spot a great choice for a winter vacation. It’s great during the summer too, with access to plenty of hiking, biking, wildlife, hunting, and fishing in the area. Spa Hot Springs Motel has taken the naturally occuring geothermal spring which has been used for centuries by Native Americans and settlers in the area, and turned it into a comfortable, spacious pool where guests can relax and relieve their tense muscles after a long day of enjoying the great outdoors. At Norris Hot Springs, the ‘Water of the Gods’ is a flowing natural spring at a temperature of about 120 degrees Fahrenheit. The waters are cooled to a more reasonable temperature of 100, and collected into a spacious, comfortable pool with wooden bench seating around the edges. The pool is drained every night to prevent buildup of grime and bacteria, and then it refills naturally every day. An adult ticket to soak in the springs is $7, and Norris Hot Springs also has a music venue, bar and restaurant, and a campground on site. The hot springs at Quinn’s Hot Springs Resort in Plains, Montana consist of several pools which vary from a steamy 106 degrees down to a more mellow 89 degrees, as well as an ice pool where the very brave can plunge into cold waters to increase circulation or take a break from their hot soak. Guests staying at the resort, with its rustic wood cabins overlooking water and mountains, have access to the springs pools as much as they want, but visitors to the area can also purchase access to the springs in 3 hour blocks throughout the day. Sleeping Buffalo Hot Springs was named such because of a nearby rock formation, and it has been in continuous use since 1922. The springs collect into two indoor pools at the resort, and the waters there take on a unique reddish color due to the high concentration of iron in the springs. The two pools are about 106 degrees and 90 degrees, respectively, and there is also lodging on site for guests who wish to stay at the springs. Visitors can choose from a hotel room or rustic cabin, and there is also a cafe, gift shop, and banquet rooms at the resort, all of which are available for guest use. 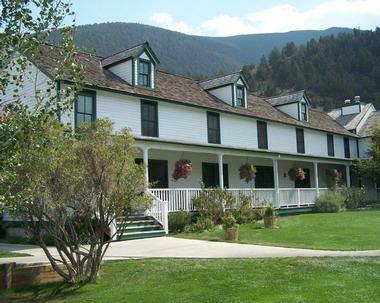 Guests staying at Symes Hot Springs Hotel have unlimited access during their stay to the three hot springs pools. The three pools are, on average, at 107 degrees, 101 degrees, and 95 degrees, and the largest of the three is a perfectly comfortable swimming pool for exercise or recreational activities. 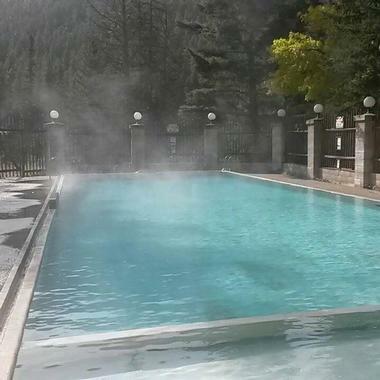 For visitors to the area who would like to purchase a day pass for the pools, Symes Hot Springs charges $10 a day for adults and $5.50 for kids under 11. They are open every day of the year, and on weekends the pools are open until midnight, so whether using the springs for relaxation or socialization, Symes Hot Springs is the perfect place for a soak.